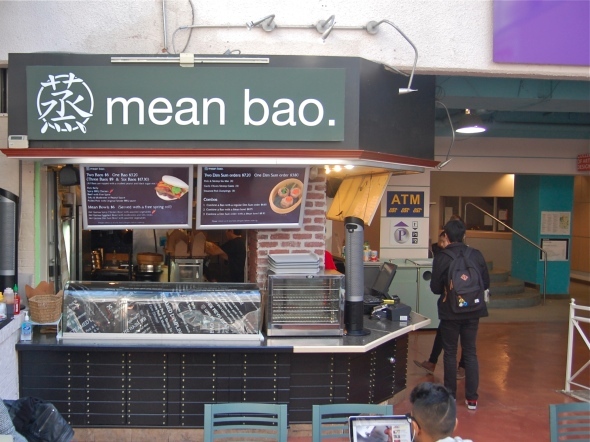 Mean Bao (literally: bread/buns in Cantonese) has set up shop in the Village by the Grange food court and has been serving up sandwiches and dumplings since late summer. The kitchen is tiny and the menu correspondingly small, but what Mean Bao lacks in stature it makes up for in savouriness. It's good - and not just for a food court. The Bao ($3.20/2 for $6) are the main attraction at Mean Bao, naturally, with five on the daily menu and rotating specials; cuttlefish is the additional choice at the time of our visit. 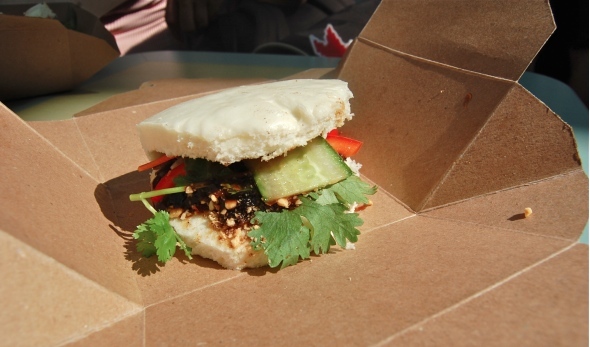 These steamed bun sandwiches are reminiscent of David Chang's signature pork bun at Momofuku (in composition at least - let's not go nuts here), with meat or tofu accompanied by cilantro, peanuts and thinly sliced cucumber and carrots, plus hoisin and other sauces as dictated by the composition of each particular bao. The bao themselves are freshly steamed, light and with an almost pillowy quality. 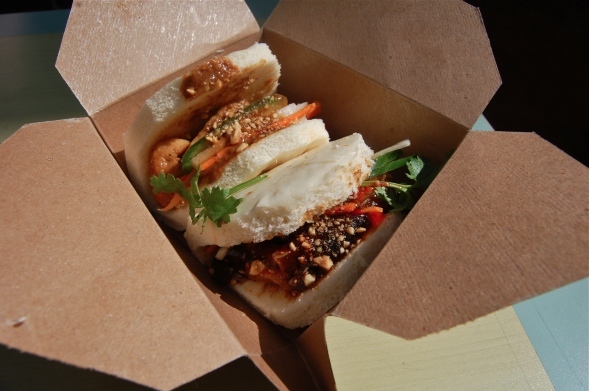 Though all the sandwiches are good the best one we try might actually be the tofu and mushroom with peanut sauce. The sauce is present but not overwhelming, and the fried tofu and soft mushrooms have an airiness that is a perfect compliment to the bao. The pork belly and beef baos are also strong, with the beef standing out in particular. It has the developed texture that comes with extensive braising, and the meaty sauce it's paired with is rich and savoury. The pork belly is similar, but relying on hoisin alone for additional flavours means the meat has to stand out on it's own, which it does to modest effect. The other specialty at Mean Bao is the steamed dumplings ($3.80 for an order of for dumplings, two orders for $7.20), with shrimp cake and shrimp and pork siu mai coming especially recommended by the folks behind the counter. 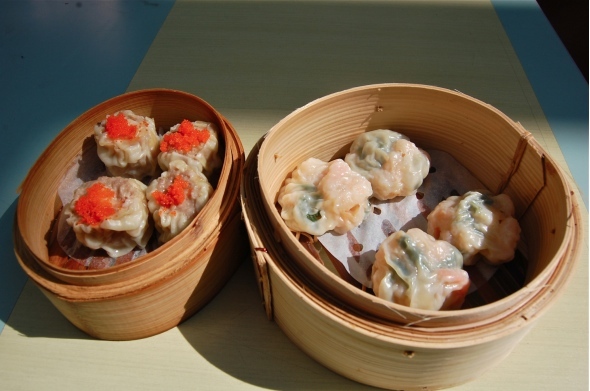 The dumplings come out steaming hot, either in a takeaway carton or little bamboo steamer, depending on one's travel plans. The shrimp cake is plenty shrimpy, which is to say that there is a healthy quantity of shrimp, subtly augmented with chive. This classic pairing works to strong effect here as well. The thin translucent dumpling skin is a little thick in parts, making a half bite a little gummy, but that's worth mentioning only in passing. The shrimp and pork siu mai is mostly pork with a little speck of shrimp on top, but the pork is juicy and delicious, with the shrimp providing the cherry on top, so to speak. The third main menu item is the mean bowl ($6.00) - quinoa and an assortment of meat and/or vegetables - which is a bit more ordinary than the other dishes on offer. The quinoa is well cooked, and the vegetables definitely lean towards the crunchier side of the equation (much better than the opposite, at least in my opinion). The soft eggplant in the eggplant bowl forms a sauce that mixes with the quinoa, and the tofu is again great, though one wishes there was a bit more of it. 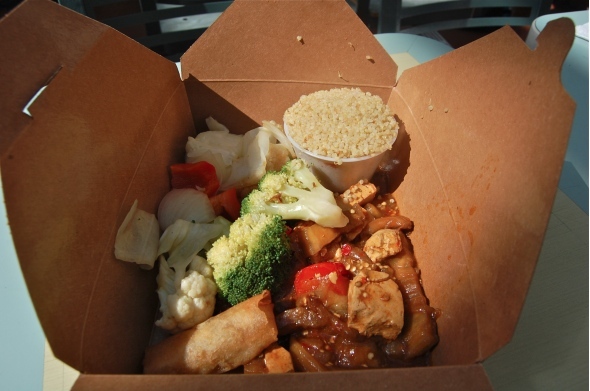 Though the mean bowls lack the pizzaz of the other items on the menu they are a solid and hearty lunch, and there is a side bar of hoisin, siracha, vinegar and soy sauce for one to augment one's food as required or desired. In addition to being delicious the food at Mean Bao is also very affordable, as a bao and an order of dumplings will set you back $6.65 (helpful I'm sure with a large student population next door at OCAD). Food court seating can leave a little to be desired, and as word starts to spread a lunch rush is beginning to form, but don't let these things stop you - food court or not, Mean Bao is worth a visit.